1. Usage Scope: For indication and monitoring the effect of the EO sterilization. 2. Usage: Peel off the label from the back paper,paste it to the items packets or sterilized items and put them into EO sterilization room. 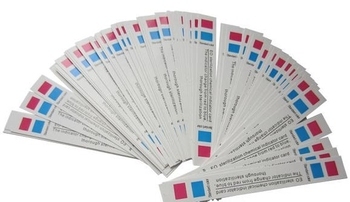 The color of label turns blue from initial red after sterilization for 3hours under concentration 600±50ml/l, temperature 48℃ ~52℃, humidity 65%~80%, indicating the item has been sterilized. 3. Note: The label just indicates whether the item has been sterilized by EO, no sterilization extent and effect is shown. 4. Storage: in 15℃~30℃,50%relative humidity, away from light, polluted and poisonous chemical products. 5. Validity: 24months after producing.